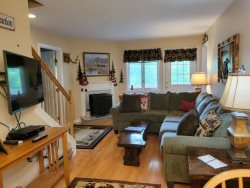 3 Bedroom multi level condominium, 3rd floor front with balcony and deck and great views of Loon Ski Area. Master bedroom offers Queen bed, full bath, and walk-in closet. Guest bedroom offers 2 Twin Beds, full bath.Upstairs area features 3 Twin Beds, Queen Bed and Double Bed, TV sitting area, A/C, and deck.Fully applianced and utensiled kitchen with breakfast bar and 2 stools; dining area with table and 4 chairs. Living room area offers A/C, 32" Flat Screen TV, DVD, gas fireplace, and balcony. High-speed WiFi and free local calls. As our guests you will have access to the in-house fitness center which offers an indoor hot tub, indoor heated pool, cardio and weight rooms, 3 dry saunas, racquetball court, family game room, outdoor seasonal hot tub and heated pool. New picnic/charcoal grilling area in the rear of the building. Balcony, Laundry Facilities, Air Conditioning and Heat, Gas Fireplace, Full Kitchen, Microwave, Dishwasher, TV, VCR/DVD, Elevators, WiFi, Ski Locker, Ski Shuttle, Free Parking, Telephone (free local calls), Express Check Out, Indoor Heated Pool and Hot Tub, Seasonal Outdoor Pool and Hot tub, Game Area and Full Fitness Center. Close to Skiing, Golf, Hiking and Attractions.